Ships tomorrow if you order in the next 18 hours 18 minutes. 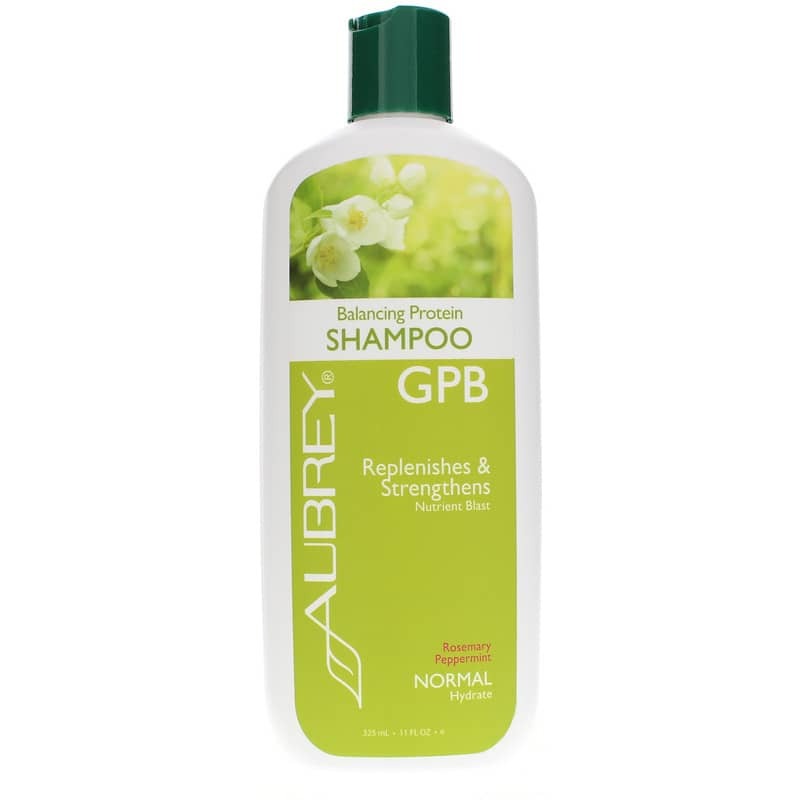 GPB Glycogen Balancing Protein Shampoo by Aubrey Organics is a natural shampoo that cleanses and strengthens your hair. It is a great choice for full, shiny, healthy hair! It is designed for all hair types. 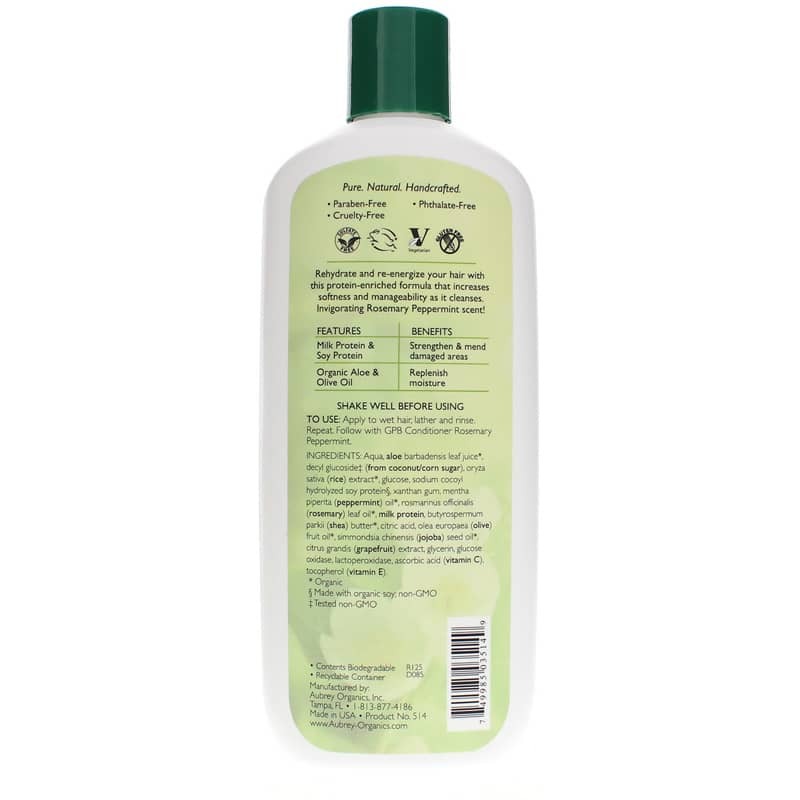 Feed your hair a healthy, balanced diet with this protein-enriched shampoo. Shine-enhancing fruit acids and herbal moisturizers smooth hair fiber and infuse it with vitamins to rehydrate and re-energize your hair and leave it healthy and lustrous. Aqua, aloe barbadensis leaf juice(1), decyl glucoside (from coconut/corn sugar), oryza sativa (rice) extract(1), glucose, sodium cocoyl hydrolyzed soy protein(2), fragrance(4), xanthan gum, milk protein, butyrospermum parkii (shea) butter(1), citric acid, oenothera biennis (evening primrose) oil(1), simmondsia chinensis (jojoba) seed oil(1), rosmarinus officinalis (rosemary) leaf oil(1), citrus grandis (grapefruit) extract, glycerin, quillaja saponaria root extract, ascorbic acid (vitamin C), glucose oxidase, lactoperoxidase, ricinus communis (castor) oil, tocopherol (vitamin E). Shake well before using. Apply to wet hair, lather and rinse. Repeat if needed. Follow with GPB Glycogen Balancing Protein Conditioner. My sister-in-law had shared these products with me. Once I tried them I was hooked and had to order my own!